Music is meant to be enjoyed and savored. And, in our line of work, dissected and studied. 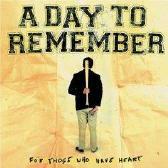 On "For Those Who Have Heart," A Day To Remember utilizes several different styles of music to get their point across. It's not easy to combine musical genres and make it work, but A Day To Remember does it with class and style. The music here starts out with solid rock'n'roll and then adds some quality punk vocals into the mix -- and A Day to Remember does it better than most of the punk acts out there today. Last, but definitely not least, they deliver a heavy metal crunch that is pure energy. Now, when they combine all of those aspects, they release a torrent of sound that is unparalleled in the present musical scene. "For Those Who Have Heart" throws a lot of music at you (with the CD containing 12 tracks) and, with each song is engaging and very well performed. The only problem I can find with this CD is also part of its attraction. Sometimes, the mix of genres tends to be a little disconcerting. As A Day to Remember matures, I think they'll get better at blending their music styles and their music will only get better. For more information, check out http://www.adtrrock.com. Revised: 09 Apr 2017 12:09:59 -0400 .